Looking for somewhere to host your next birthday party or special event? With up to 18 VR Stations, a wide variety of content and a private party room available for post-play celebrations, your next party is bound to be unforgettable! * plus TAX. 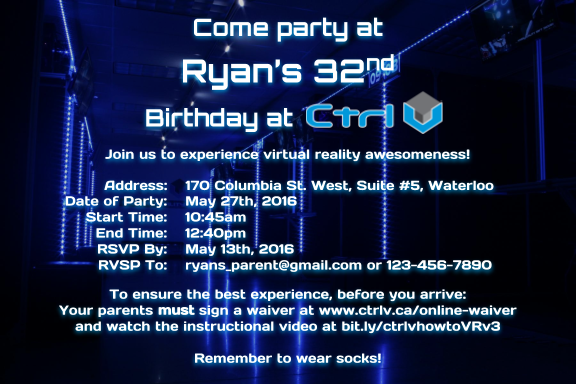 Includes 6 VR Stations for one hour followed by 60 minutes in the Party Room. * Additional stations may be added at an additional cost. If you book 6 or more VR Stations, you can also add the Party Room to your booking for the 60 minutes following VR. The Party Room includes tables, a full-sized refrigerator with freezer and enough seating for up to 20 guests. You are welcome to bring your own food, drink and dinnerware.